I’ve been too chickeny to write my earthquake story, yet happy enough to take photos. Donna was in the central city close to Victoria Street. Shane ran to get their little daughter Sabrina. She has no recollection of getting to safety. 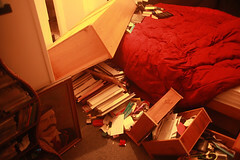 The bookshelves fell across the bed but missed her “because she is so short”. A few objects fell down in the house but the kitchen was almost untouched, except for a container of oil which left a big oil slick on the floor. After the initial drama of getting out of the house they made contact with their neighbours in the other three flats. 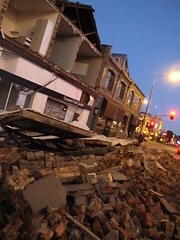 When they all calmed down people began to venture around the neighbourhood and discovered the Daily Bagel building collapsed on to the street and they began to realise how serious the quake had been. They never lost power and were without water for only a short time. Their flat became a gathering point for friends who came to charge phones and use the internet. The day turned into a strange social event with people sitting outside drinking beer. 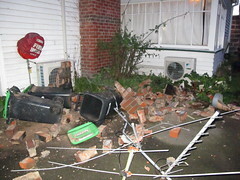 After the quake, Donna had no recollection of sound and yet the chimney had come down outside their bedroom. Rosary House next door has a very large water tank and for a while afterwards they could hear was a really loud, strange, slosh, slosh, slosh. That day and the next day they gathered extra batteries and torches, secured bookshelves and tidied up the house. 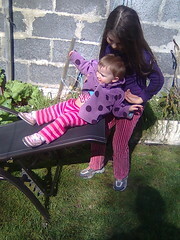 Having Sabrina was a distraction as normal things like feeding her needed to go on so as Donna said “even though you are fearful for your child they are a way of not thinking about the bad things”. Sabrina loved the distraction and interest of lots of people around. Donna was quick to get in touch with her mother who was on her own. Her father was in Dunedin and immediately hitched a ride back on a truck – probably the only person trying to get to Christchurch! In the days that followed Donna grappled with what to do about work and wondered about leaving town. She felt so unsafe that she was afraid that if she went, she would find it hard to come back. She was glad she stayed and worked through it. Sal has family in ChCh… the time until we could get in touch with them was agonzing. It’s good that we live in a time when ppls stories can get out so easily. Thank you so much for turning a very scary day into something very cool. Way more important than being able to charge my phone or check the Internet at your house was the sense of comradery and local community – while more people dropped by and shared their stories. What a day! Thanks to you and Shane’s and your neighbours for ur wonderful hospitality, and beers. And Miriam’s whiskey. Thanks Tulip, it was wonderful & strange how a scary event turned into a lovely communal gathering. Hi I just jumped across here from Twitter. Reading your story…. the earthquake was completely silent to me too, how weird. I thought it was like being in the program “destroyed in seconds” watching but not hearing! !